Spider-man 3 is going to give fans - at least some of them - what they've been clamoring for now for a long time. 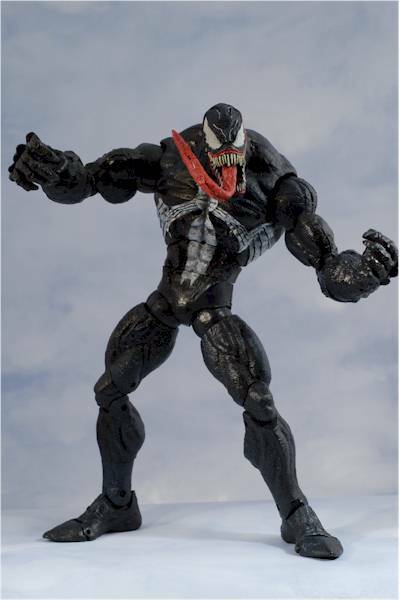 They'll finally get an onscreen version of one of his most famous foes, Venom. 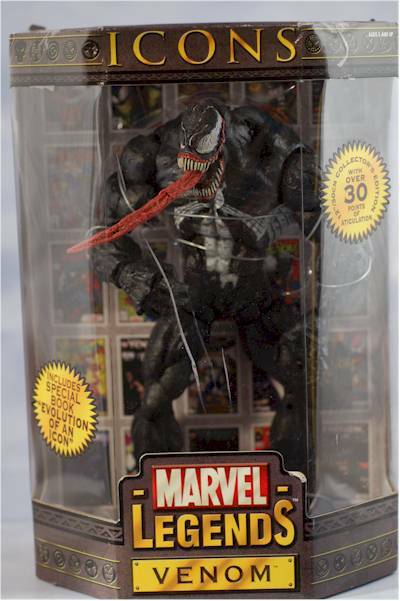 Venom first hit the comics in 1988, and was drawn by a much younger Todd Mcfarlane. He's one of those rare modern creations that has actually had legs, becoming more popular with time and an actual mainstay of the Spider-man universe. Is Venom a bad guy? He certainly looks that way, but he's always considered himself one of the good guys, who just happens to hate Spider-man with every fiber of his symbiotic body. And while Venom does help those he considers 'innocent', Spider-man has always treated him as one of the evil doers, a homicidal maniac that simply must be put away. And there you have an interesting relationship, whether neither character is capable of seeing the other in any way outside of their very black and white definition. 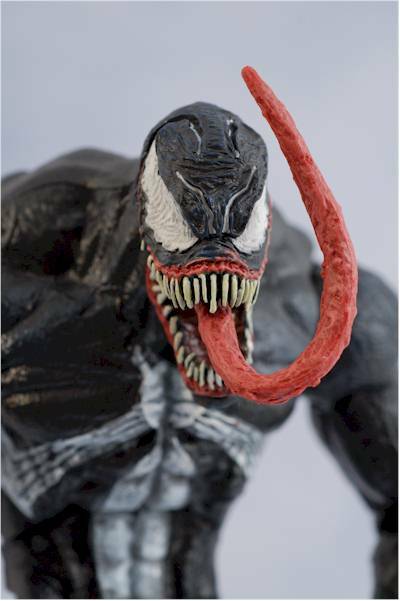 Toybiz selected Venom for the second release of their new 12" Icons line. I suppose that since he's part of a group of figures called 'icons', that includes Hulk, Captain America, Wolverine and Iron Man, that he truly has become one of the major players in the Marvel universe. He and the Hulk are shipping right now, and are showing up at Toys R Us first. You should see them at Target and other stores soon though, and I have some online suggestions at the end of the review. There will also be variants shipping of both figures, but they haven't started to hit yet. Note that Spider-Man was initially to come in this wave, but has been postponed until the next wave. The Icons packaging is really growing on me with time. The large window up front shows the figure from three sides, will the open back panel gives you a great view of the included Icons comic book. The box is nice and sturdy, with good graphics, and it's technically collector friendly, since you don't have to destroy it to remove the figure. The plastic insert behind Venom, which would normally be sealed to the cardboard tray, is not this time around. Sure, there's a billion twisty ties that you'd have to replace to put him back, but you could do it with a little patience. More likely, you could keep this box to store him in, and not have to damage the cardboard insert when you remove him. 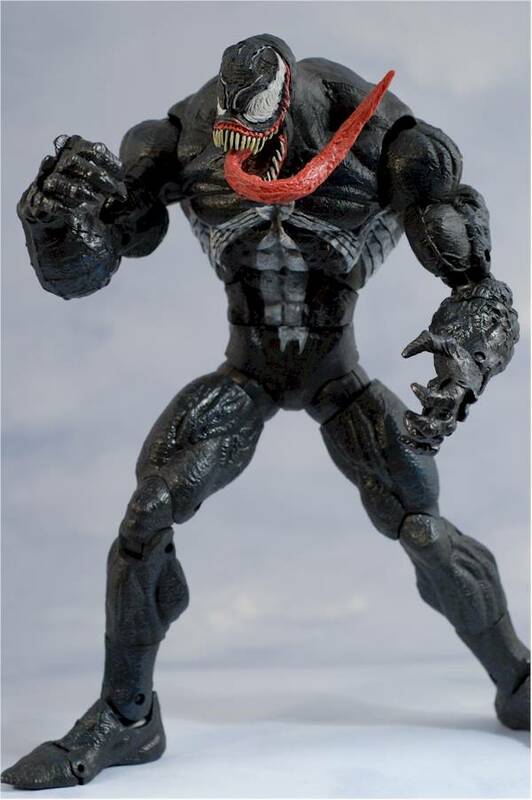 Venom is a symbiotic creature created from a man's basic body - Eddie Brock - taken over by an alien parasite. Therefore, while the final version of the creature is generally human shaped, and usually the same, he can morph around a bit, making any sculpt an approximation. This version is a fairly happy medium between his most wild appearances in the comics, and his most tame. 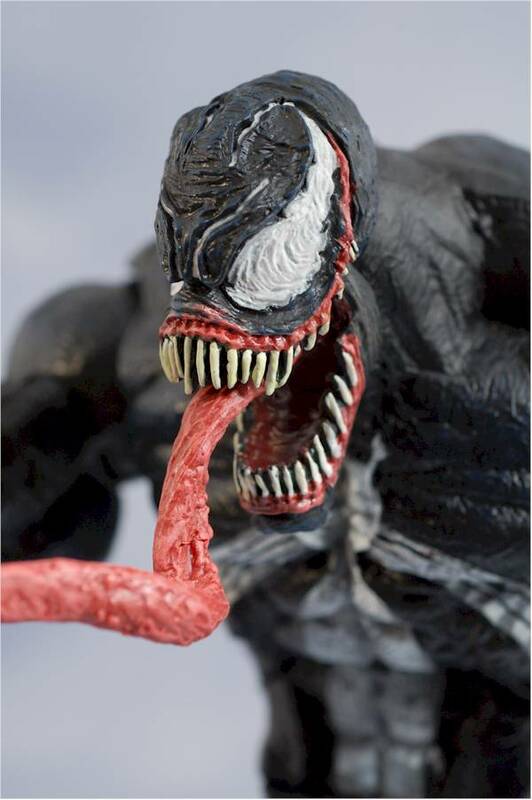 Unlike the very early versions of Venom, his skin isn't smooth, but craggly and heavily textured. There's a ton of sculpt detail in the sinews, muscles, wrinkles and veins, and the work on his head and mouth is very impressive. Even the tongue has tons of texture, which is gross enough. Ah, but to make it a little grosser, it's also extremely long. My one complaint about this figure is that I'd have preferred a removable tongue, and perhaps a couple of them to pop on and off of different lengths as accessories. You have to have a long one, but other options would have been nice. Ah, I do have one other complaint, although it's more of a question - when did Venom get white eyebrows? It looks a little odd to me, but it's a very minor issue. Some folks may find the elbows an issue, since the double pin joint does make them appear a tad skinny compared to the rest of the arm. For me, this was not an issue, but your mileage may vary. Scale is great, standing at 13 inches tall and towering over most of the other 12" figures out there. His bulk also looks great, taking up much more space than a normal human form. They've done an excellent job of capturing the comic book appearance without looking silly. Except for maybe that tongue. The majority of the figure is actually molded in black, reducing the issues with paint. All the parts match pretty well in tone and color though, which can still be an issue when they are made from different mixes of plastic. What paint is here is predominately on the face and symbol. The cuts between the black and white are pretty good, and they've purposefully blended it somewhat at the edges to give it a more 'symbiotic' rather than costume look. The teeth are nice and disgusting, with clean paint work around the mouth. 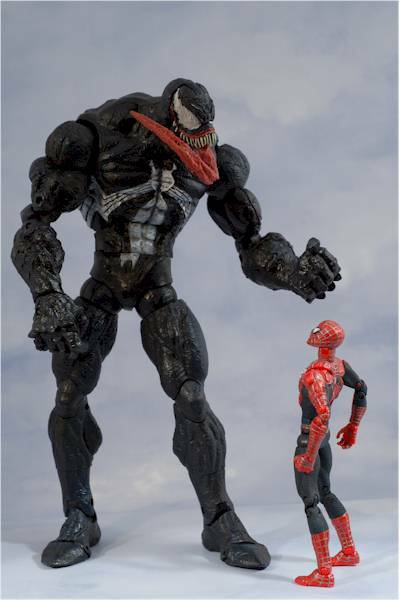 Just like his smaller Marvel Legends cousins, Venom has plenty of articulation for even the biggest joint junkie. He has an articulated neck, with the usual pin joint that allows for forward and backward motion (along with turning), but no tilting. Unfortunately, his general design and sculpt doesn't allow for much forward and backward either, so he's mostly stuck with turning his head side to side. His jaw is also articulated, but doesn't hold any position on it's own. 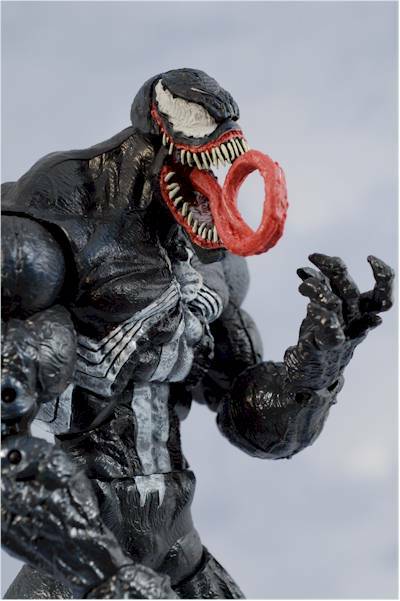 And of course, that tongue that even Gene Simmons would envy is articulated, since it's made from bendy material. It also turns in his mouth, but I really do wish it was removable. A long version like this is necessary of course - it's how we see him most of the time on covers - but some other versions would have been nice as well. He has ball jointed shoulders and hips, and both have a pretty good range of movement. As will all ML's, the hips can be difficult to work with at first, but get some practice and you'll be able to turn the ball to the front or side, giving the leg the ability to move forward and back or side to side. Both the shoulders and hips are jointed on either side of the ball too, giving his limbs the ability to turn at these joints as well. He has double jointed pin elbows and knees, a cut waist and calves, and pin joints at the ankle and half foot. The ankles also have a slight rocker movement, making deeper stances possible. The wrists are pin joints that also turn, and every finger is articulated individually. That's fingers, not thumbs. Finally, he has one of those clicky chest joints that allows him to hunch forward and tilt back. While it's fairly useless with most characters, it's almost a must with a guy like Venom. Adding that little extra hunch to his stance gives him just the right look. On mine, there is a weird piece of plastic that was sticking out of the waist joint, sort of like a burr or excess that wasn't removed before assembly. I cut it off and was done with it, and I'm hoping that it didn't indicate any actual damage to the joint inside caused when he was popped together. Most of the joints are tight, and he held poses well. And unlike his smaller brethren, none of the pins felt weak or soft. Okay, so this is a bit of a problem. 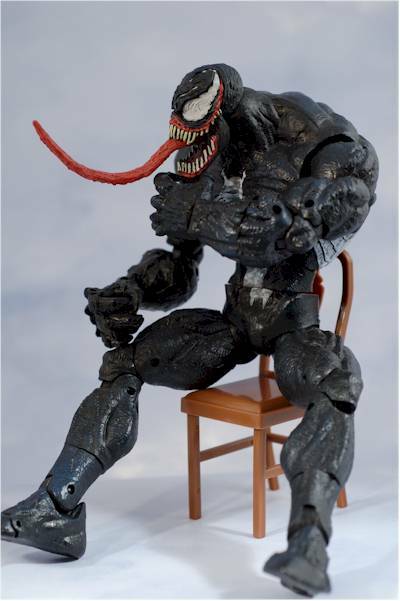 Sure, Venom isn't much of a gadget kind of guy, and I doubt he owns an iPod. But the only accessory we get is the Icons comic book. As comic books go though, it's pretty sweet. It has a fairly in depth history, a bibliography of his appearances, and quite a few pages of cool renditions of the character by various artists. As comic book inserts go, these Icons books are some of the very best. Still, something additional would have been nice, and would have pushed the Value score down below even higher than it already is. God, I wish we had stuff like this when I was a kid. Oh, our sixth scale offerings were pretty damn good between Best of the West, G.I. Joe and Captain Action, but we didn't have anything quite like this in the superhero/villain department. And you don't even have to know who Venom is to love playing with this guy. He'd make a fantastic monster in any battle, and his bulk and height make him a great opponent for the heroes in your kid's posse. These days, it's so rare to find a great value. 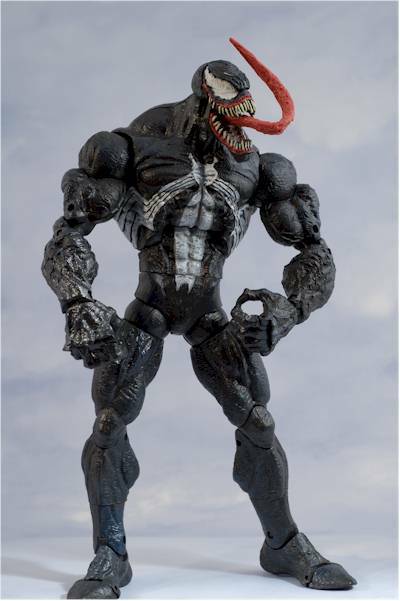 But here you're getting a well sculpted, well painted, well articulated, BIG sixth scale figure, all for around $15 - $16 at most brick and mortar retailers. 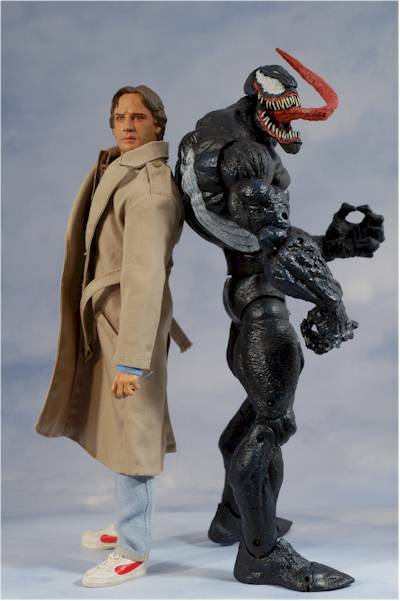 Toybiz has produced some excellent figures in the entire family of Marvel Legends products, all at a great value. Let's hope Hasbro continues this tradition. Of course you'll want to pick out the best looking paint - but that's pretty much the only issue you'll have to worry about. I reviewed the masked version of Wolverine, and I admit it - I was a half star generous with him. The longer I had him, the more the smallish head and heavy paint wash bugged me. But part of that extra half star was simply that I was so happy to be seeing a well done line of sixth scale Marvel characters at such a reasonable price, even if they weren't clothed but all plastic. There's no doubt in my mind though that Venom deserves the high marks. This line is getting better with each release already, and I can't wait to snag a Hulk. There are still a few issues, including tough joints to work with, and some funky choices (like Venom's eyebrows), but overall this line is likely to be my favorite Marvel line of the year, and the more I played around with Venom, the more I liked this figure. He's a definite must buy for the Marvel fan, and a great addition to the Icons line up. Bring on Spider-Man! - CornerStoreComics has pre-orders up for $17 each. - Killer Toys has pre-orders up for $20 each. - YouBuyNow doesn't have these listed yet, but they have the first three for $19 each. So far, I've only reviewed the previous Wolverine.